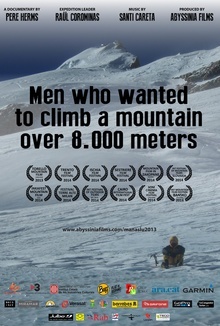 This films is about two men - Raul, a mountaineer; and Pere, a filmmaker - who are united by the goal of climbing a mountain higher than 8.000 meters. For months, the filmmaker and mountaineer tour the Himalayas, experiencing life there, and finishing off by climbing the eighth highest mountain of the world, the 8.163 meter Manaslu. The protagonists spend month exploring different corners of the Himalayas; during the two months acclimation period, both Raul and Pere prep themselves physically and mentally for their final climb, which they will undertake without a guide or supplemental oxygen, totally stripped of civilization except for their gear and little yellow tent. The film not only recounts the experiences and adventures of the expedition, it also tries to dig deeper into the issues that lie beneath two men's transcendental need to roam the mountains, as spiritual as it is inescapable. This emotional and physical experience is reflected in the footage of miles of absolute whiteness, the lack of oxygen, and the scarcity of people making them look like two yellow dots in a sea of snow. This is a film about the thrill of perseverance, friendship, and hope. 0 Comments. Add your thoughts.